Now in its 8th year, the program was established by insideARM, the leading independent news and information provider for the collections industry, and is administered by Best Companies Group, which conducts over 40 local, national and industry “Best Places” programs each year. This survey and award program was designed to identify, recognize and honor the best places of employment in the collections industry. As a whole, the industry benefits the nation’s economy and its workforce by recovering over $55 billion owed to businesses and providing over 230,000 jobs. The industry’s employees pay nearly $2 billion in local, state, and federal taxes, contribute over $130 million to charities, and spend over 2 million hours volunteering their time annually (source: ACA International/Ernst & Young 2014 Impact study). This year, 47 companies met the standard to be selected. The Best Places to Work in Collections list is divided into three size categories: Small (15-49 employees), Medium (50-149 employees) and Large (150+ employees). • Must be a Collection Agency, Collection Law Firm or Debt Buyer. Companies from across the U.S. entered the two-part survey process to determine the Best Places to Work in Collections. The first part consisted of evaluating each nominated company’s workplace policies, practices, philosophy, systems and demographics. The second part consisted of an employee survey to measure the employee experience. The combined scores determined the top companies and the final ranking. Best Companies Group managed the overall registration, survey and analysis process and determined the final rankings. 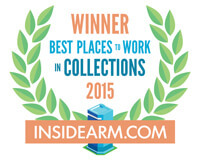 Click here for more information on the Best Places to Work in Collections program.